In a bid to get more homeowners approved for its flagship FHA Streamline Refinance program, the Federal Housing Administration (FHA) made an update to guidelines. FHA-backed homeowners may find it simpler to use the FHA Streamline Refinance as the program was intended — without income verification, without employment verification, and without credit check. Not everyone will qualify for an FHA Streamline Refinance, but millions of FHA homeowners will get access to today’s low mortgage rates. FHA mortgage (Apr 24th, 2019) rate quote” linktext=”Click here to get a FHA Streamline Refinance rate quote”]. The FHA Streamline Refinance is a special refinance program for people with FHA mortgages. It’s a nearly paper-free refinance meant to sail through underwriting and get you to the closing table quickly. Your must have made at least 6 payments on your current FHA mortgage. You must not have made a late payment on your mortgage going back 3 months. You must not have made more than one 30-day late payment going back 12 months. Beyond that, the FHA Streamline Refinance is basic. There are no income verifications; no job verifications; no credit score verifications. There’s no home appraisal needed, even, regardless of loan-to-value (LTV). 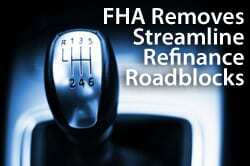 The FHA Streamline Refinance is the original mortgage for “underwater homeowners”. With an FHA Streamline Refinance, your home can have 400% LTV or more and it doesn’t matter to your loan approval — your home’s value is ignored completely, with no changes to rate or fees. This is a huge benefit to FHA homeowners in places like Phoenix, Arizona; Orange County, California; and Atlanta, Georgia where home values have dropped precipitously since 2005. No matter where you live, so long as you meet the FHA’s 4 basic requirements, you’re FHA Streamline Refinance-eligible. Click here to get a FHA Streamline Refinance rate quote (Apr 24th, 2019). The answer is “no”. The FHA is actually reduce its risk by making these loans. Remember : The key idea here is that the FHA doesn’t actually make loans to homeowners. Rather, it insures the banks that make loans to homeowners. In this way, once a homeowners has his mortgage in the FHA’s “system”, so to speak, the FHA is on the hook for that loan no matter what its rate or loan size. This is why FHA homeowners are not allowed to increase their loan balances with an FHA Streamline Refinance. Raising the loan size would raise the FHA’s exposure to default. This is why the FHA Streamline Refinance skips job, income and credit verifications. It really doesn’t matter if someone lost their job; or has a 500 FICO — the FHA is still on the hook for that loan. It’s in the FHA’s best interest to put all FHA-backed homeowners into the lowest mortgage rates possible because with lower payments, in theory, come fewer defaults, which means fewer claims. Although the FHA says it will accept streamline loans with no verifications, lenders have thus far ignored those instructions. Many lenders not only verify income and employment, but they put strict credit score requirements in place, too. Huge numbers of FHA-backed homeowners have been turned down for loans since 2009 because of FICO scores under 640; or because of unemployment; or because of high debt-to-income ratios. This is not what the FHA intended when it made the FHA Streamline Refinance guidelines. Therefore, the FHA made changes. Specifically, it changed how it calculates its “Compare Ratios”. Compare Ratios are a little-known part of the mortgage business, but paramount to the FHA Streamline Refinance process. Simplified, a Compare Ratio is an FHA lender’s loan default rate as compared to the default rate of other FHA lenders in the area. For example, if an FHA lender in Virginia has a 6% default rate and 3% of all FHA loans in Virginia defaulted, then the FHA lender has a Compare Ratio of 200%. The FHA uses Compare Ratios to determine which banks are making the most “bad loans”. In general, lenders with Compare Ratios over 150% are considered a risk to the FHA; those with Compare Ratios over 175% get put on notice; and those with Compare Ratios over 200% are often sanctioned and lose their ability to make FHA-insured mortgages in the future. Until recently, the FHA had included FHA Streamline Refinances in its Compare Ratios, leaving banks liable for loan performance on loans they may not have originally underwritten. Banks were reluctant to take on that risk because none want to be on the FHA’s Watch List, nor do they want to face formal sanctions. It also led to a never-ending game of One-Upmanship. Lenders would engage in FHA Streamline Refinances, but with an ever-escalating series of loan guidelines. For the banks, making FHA Streamline Refinances wasn’t about making great FHA loans — it was about making fewer bad FHA loans than the next guy. This explains why banks did verify income; and did verify employment; and did institute minimum credit score standards — even though the FHA said they didn’t have to. Banks didn’t want their Compare Ratios to rise. The FHA acknowledged this issue and, similar to how HARP 2 waives reps and warrants on HARP refinances, the FHA now exclude FHA Streamline Refinances from its Compare Ratio calculation. Banks are no longer penalized if they make an FHA Streamline Refinance loan that goes bad. Some banks still underwrite to the old, stricter Compare Ratio guidelines, but some do not. Long-term, as the new Compare Ratio guidelines are adopted by lenders, getting approved for an FHA Streamline Refinance should be faster, easier and, for lack of a better word, more streamlined. Turned Down For Your Streamline Refinance? Try Now! Over the past 2 years, there have been hundreds of thousands of FHA-backed homeowners whose FHA Streamline Refinance application were denied in underwriting. Maybe yours is one of them. Or, maybe you never applied because you were out of work; or your credit score was too low. It’s time to re-apply. FHA mortgage rates are low and the book on refinancing just opened up wide. Reserve your spot and get your rate. It’s time to (finally!) drop that rate.